While sleuthing around the city of Milwaukee, I spied this interesting image. which is the wonder and beauty of photography. I'm linking into Kat's, Exploring with a Camera: Waiting to Click. Oh, wonderful! You did capture a perfect gesture, you can tell you studied it! 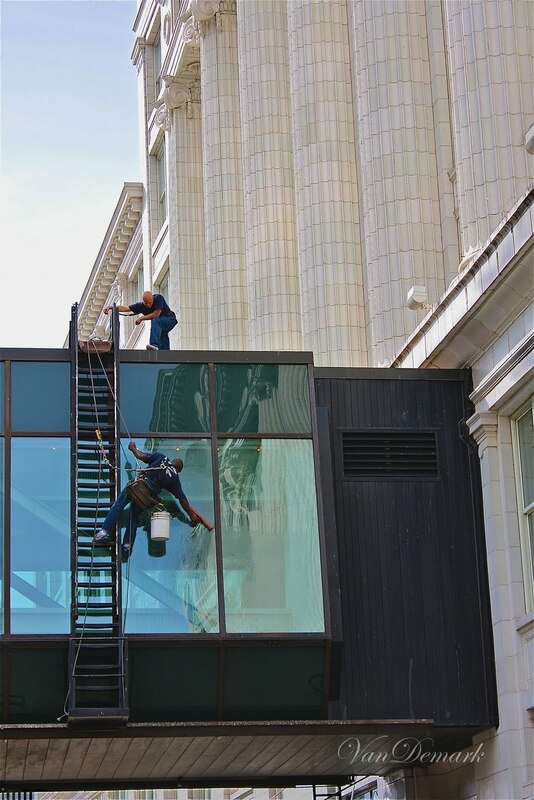 I love this whole composition - the contrast of the old and new architecture, along with the window washers. So fun! Thanks for linking in to Exploring with a Camera! Yes..patience and persistence was definitely your reward. Wonderful composition..and perfect 'moment' captured. Just click! What a wonderful example of waiting to click! I love that moment of waiting for the right shot, and then it arrives! Cool shot! Patience pays off! such a great shot...love everything about it!! This is so cool - great shot!